St. George Island, Cape San Blas, Mexico Beach, Alligator Point and anywhere in the Apalachicola area! 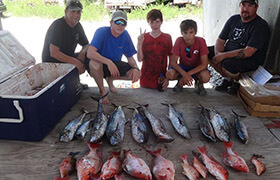 Book Me A Charter We are a family friendly, inshore, offshore fishing charter service in Apalachicola, St. George Island, and Cape San Blas area. 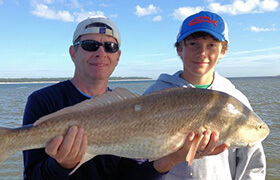 Inshore Bay Fishing we target Red fish, Trout, Triple tail, Black Drum, Pompano, Spanish Mackerel, and Flounder. Offshore Fishing we target Snapper, Grouper, King Mackerel,Black sea bass, and other species. We personalize your trip to insure you have a great experience to make your next Apalachicola fishing charter or sightseeing adventure a fun memorable trip for all to enjoy. Captain Dwayne Allen will hook you up with the best fishing in the St George Island, Cape San Blas, and Apalachicola area!! I would love to take you fishing or touring in my backyard. Feel free to contact me for more information or to book your Charter. I look forward to being on the water with you soon! Call today to make your reservation! We are located in Apalachicola, Franklin County, Florida, on the Apalachicola Bay, approximately 70 miles west of Tallahassee, and approximately 60 miles east of Panama City. We are small fishing communities that some call the "Forgotten Coast". Our seafood is world renowned and our fishing is excellent. We have the Apalachicola River, the Apalachicola Bay, and the Gulf of Mexico in our backyard. Enjoy fishing Apalachicola Bay, fishing Apalachicola River and fishing in the Gulf of Mexico. Our expert guide fishermen are familiar with these waters and know how and where the fish feed. On your trip you may catch Redfish, Trout, Sheepshead, Drum, Tripletail, Flounder, Mackerel, Grouper, Snapper, Sea Bass, Dolphin (mahi-mahi), Amberjack, and a variety of many others. Here in Paradise, we have it all! Dolphins are a frequent sight on our tours.Let the wind blow through your hair. Breathe the fresh salt air. 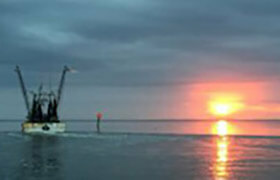 Watch the boats as they harvest seafood, be it oysters, shrimp or fish, and sometimes talk to the fishermen as they work. Visit Little St. George Island for exploring and shelling Adventure while on your sightseeing trips. Our river is full of wildlife: turtles, birds, and of course alligators. These are just few of the things that you may see on your adventure. Had a blast! Captain Dwayne was awesome! He definitely went above and beyond for us. 5 stars all day long!! Captain was great. Would recommend 10 times over. Hopefully we can get back down and do it again in the future.